. Not this year though! 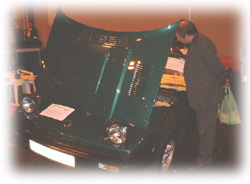 This year the holiday doesn't coincide with the International Classic Motor Show held at the NEC, Birmingham (England). Further more, this year I was invited by the TR Drivers Club to help (or maybe hinder) with their stand-manning and drive to recruit more club members. I pootled along on the second day (Sunday 9 November) and arrived in time to watch the second half of the England vs Wales Rugby World Cup quarter final game (England won by the way). This was the first time I've been anything other than a paying punter at a show and I quickly made myself useful by supplying a set of batteries when those powering Guy's pocket TV gave up the ghost with 5 minutes of the game still to run! one thing for sure though and that's that the South African's can't paint-match!! The harsh show lights certainly highlighted the poor likeness of the driver's door to the rest of the car. We also had two very fine examples of the marque - a 2.0l in Posiedon green, and a maroon(ish) v8 powered vehicle. All three cars attracted a fair bit of attention - the Sth African one for it's originality and it's history; the others for their appearance and assisted by a 'for sale' sign and modifications respectively. I wasn't actually looking for any bits from the auto-jumble!!! After failing to spot a TR7 Corgi toy amongst the sellers I made a significant purchase of a keyring! It wasn't only Corgi TR7s in short supply however as I could find only one other example of the last of the TR line. This was on the TR Register stand and was another DHC - not one FHC to be found. I need to adjust the colour settings on my camera for the next show! It's quite tiring standing around gabbing all day.
. Another bloomin DHC, at least this one had the hood up though! Which is a good job really otherwise he'd have been mighty wet!